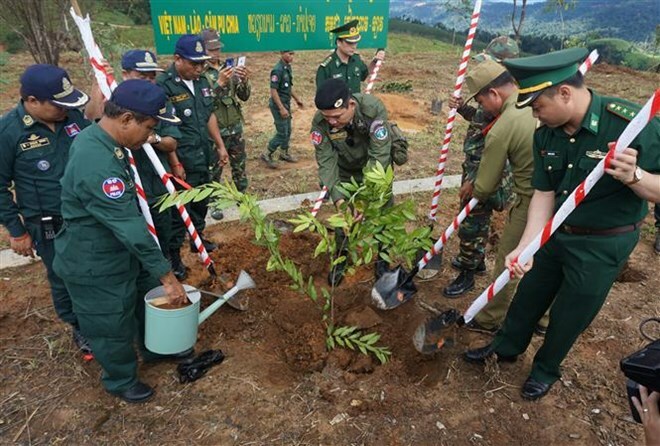 The Command of the Border Guard of the Central Highlands province of Kon Tum, the Police Department of Cambodia’s Rattanakiri province and Company 541 of the Military High Command of Laos’ Attapeu province are planting more than 700 trees of different genres such as Burma padauk, Lythraceae, champaca. The tree planting reflects the solidarity and close attachment between the three countries in general, between Kon Tum and neighbouring Rattanikiri, Attapeu and Sekong provinces, and between the border guard forces of the nations. The activity also contributes to building borderlines of peace, stability, friendship, cooperation and further development. The tree planting, which costs more than 300 million VND, is expected to be completed on September 15. Kon Tum province will organise a wide range of exchange activities among the four provinces in early November.